Two. That is the total number of career saves potential New York Yankees closers Dellin Betances and Andrew Miller have COMBINED. Friday morning, Yankees manager Joe Girardi announced that he will not designate an official closer for the upcoming season. To some, this appears that Girardi simply can’t decide between Miller and Betances. To me, I believe Girardi is hiding behind Betances’ horrid spring in order to break tradition. Girardi wants to become the first Manager to do away with the ‘closer’ title. He wants to put the pitcher that best fits a given situation in the game to give his team the best chance to win; period. I’ve never been a big fan of Girardi, but this ground breaking move would impress me. There is a possibility that this situation corrects itself if one man out duels the other, however, I think Betances is pitching hurt. Usually when a pitcher’s velocity suddenly drops significantly, there is a lingering injury waiting to show itself. 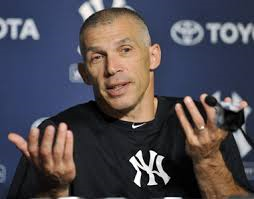 What do you think of Girardi’s decision? Do you think every team should designate one official closer, or should we do away with the title ‘closer’ all together? Not sure what to say about the “closer” designation. IT doesn’t always serve a purpose. If I think back correctly the Yankees have changed openers to closers and vice versa and sometimes it works and sometimes it doesn’t. My comment though is why would the Yankees have two pitchers with such a poor record to begin with, that you say their “potential” “combined” win record is “two” games? Not sure what you meant by the potential…..so maybe you could “splain it to me Lucy”. Doesn’t seem like they can do any closings any way. Maybe they should just spend millions more dollars to see if they can buy their way to a decision?! Go SOXs!!!!!! Dellin Betances and Andrew Miller were probably the two best non closing relievers in baseball last year. They only have two saves because they have never been closers before. Both have great potential because they are simply great pitchers. It is a debate on the closing position that some people disagree with. Thanks for reading and the comment as always!! Thanks for the info. Just read an article about these two pitchers from another source to clarify for myself what the “issue is dear”! So now I get it. Both pitchers, last year had stellar performances; one is a lefty and one is a righty. During spring training this year, Dellin’s era is over 6.00 so it is hard to tell what kind of season he may have anyway. Miller, who used to pitch for Boston/Orioles and gets paid a whopping $36 million a year ( how ridiculous is that!) may be set to close when the need arises. So I guess without a sure thing like Mariano, the “idiot” that he is, Girard will have to waffle back and forth throughout the regular season to have closure. Any way….. great Pick master of prognosticators – GO WISCONSIN!!!!!! !